Speaking of digging into dirt, Mississippi State University was part of the land grants given by the Morill Acts of 1862 and 1890. The school established itself in 1878 under the name of the Agricultural and Mechanical, College of the State of Mississippi. I’m happy they shortened their name. It wasn’t short for the football team to show up, as they laid claim to a football field in 1895. The team, who is currently coached by Dan Mullen, looks to build on some success of last year. There isn’t much success for the team’s history as the only real claim to fame that I could find is their rivalry against Ole Miss, called the Egg Bowl. Being an agricultural college, the school started out being called the Aggies. Now that was fun and all, but when a school gets renamed, the name must change too. The school became Mississippi State College in 1932 and opted for being called the Maroons, a nod to their school color. But in between the school’s first down and the Maroon moniker, a fake funeral for Ole Miss planted the seed for the real mascot name. After shutting out Ole Miss in the Egg Bowl 11-0 in 1905, a fake procession dropped a coffin on the field and carried a pup bulldog away and down the street. 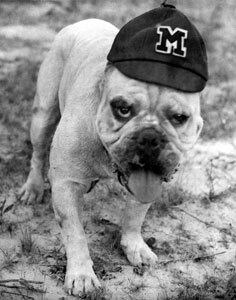 That spirit eventually let Mississippi State taking on the Bulldogs name in 1935. 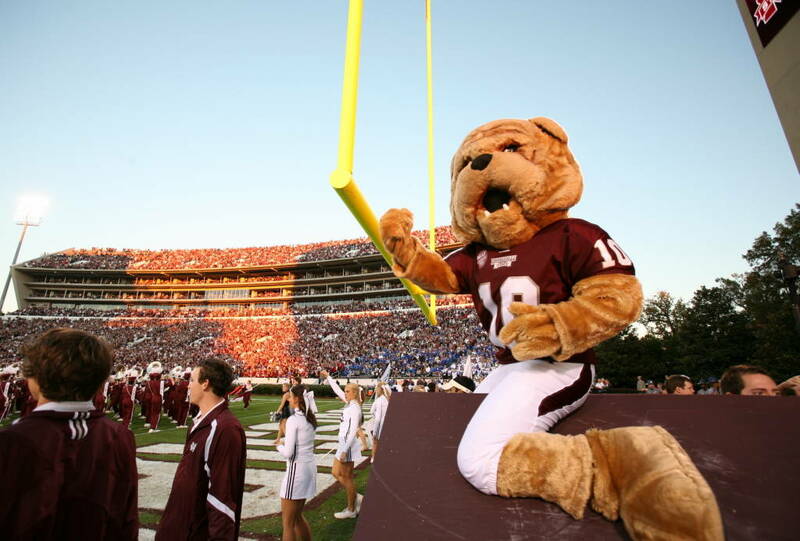 Since then, there has been an official bulldog mascot on the field. Bully is always the official name of the bulldog but there is a secondary name attached to him too. The very first one’s name is Ptoelmy. Unfortunately the current Bully, name Champ, took over a couple of weeks ago because the previous one had to be euthanized. 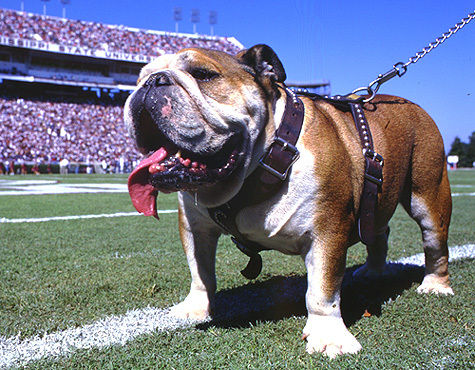 The history of the Bully stands right up there with UGA and as such, there will always be a sad story here and there of the passing of the live mascots. I guess you need to take the good with the bad. Oh, there is a costumed mascot, too. 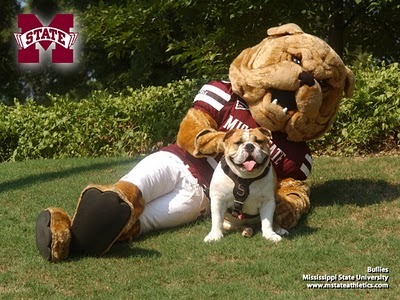 Mississippi State doesn’t offer in terms of history for the costumed Bully when compared to Bully the live mascot. That said, the spirit groups page has a nice article about the people underneath the furry head. Currently, the school employs a total of 6 mascot costume wearers. That’s a little insane. But it’s not as insane as some schools keeping the identity hidden. I get that usually students wear the garb and schools might want to protect them. I also get that they need to keep kayfabe for the mascot if anything to fool kids into liking them. At least at Mississippi State, they give the wearers some cred. I mean the costume is kinda lame itself anyway. He doesn’t really stand tall above the Georgia Bulldogs mascot. The head gear’s there, the fur, the football uniform. It’s all good. It’s just not great. Champ, today’s Bully, can stall tall with UGA. You know, it’s kinda like Mississippi State and Georgia coming into this year. Georgia has been picked to make it to the SEC title game by many pundits, including Phil Steele. Mississippi State looks to improve but fall just short of Georgia on winning. I guess will have to bite down on the season first to see if it comes true.